This is the story of two Jewish kids, Joseph and Jerome. Joe was born in Canada. His father had immigrated there from Rotterdam and opened a tailor shop in Toronto’s garment district. His mother had come from Kiev, the capital of Ukraine. An early inspiration: Douglas Fairbanks defends the oppressed people in the silent film THE MARK OF ZORRO. When he was about eight or nine years old, Joe got a job selling newspapers to help support his family. He would also scrounge around for scraps of paper — anything with some blank space on it, like the backs of discarded handbills, shreds of unused wallpaper — whatever he could get his hands on. Joe dreamed of someday becoming an artist, but he needed drawing paper. 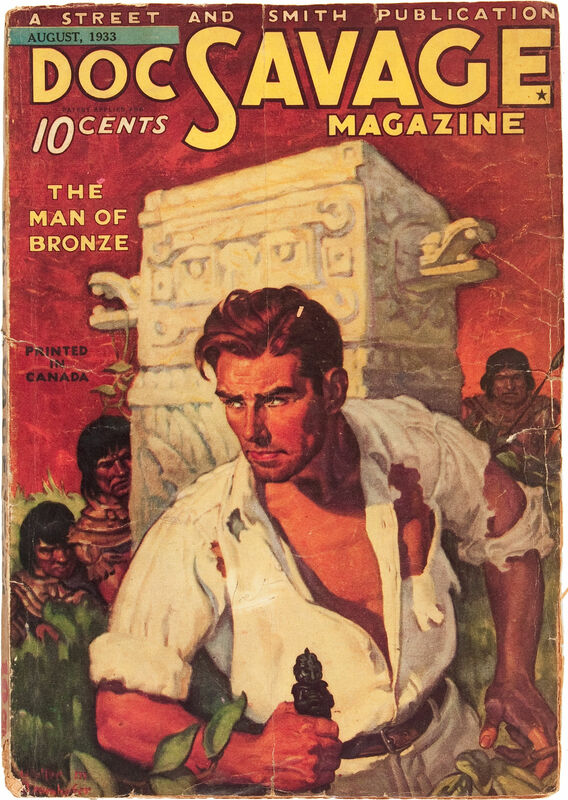 “The Man of Bronze” used his great fortune, knowledge and strength to help people. Jerry, the youngest of six children, was a Cleveland native. His dad had immigrated from Lithuania, and opened a haberdashery. America in the 1920s was indeed a land of opportunity — but it was not without its share of problems: in 1932, while Jerry was in junior high, his father’s shop was robbed. Reeling from the shock and the resultant loss of the crime, Jerry’s father suffered a fatal heart attack. A year later, Jerry met Joe. Two shy dreamers, both sons of immigrants, both struggling with adversity, both trying to fit in. These two Jewish loners discovered they had similar interests and similar goals. 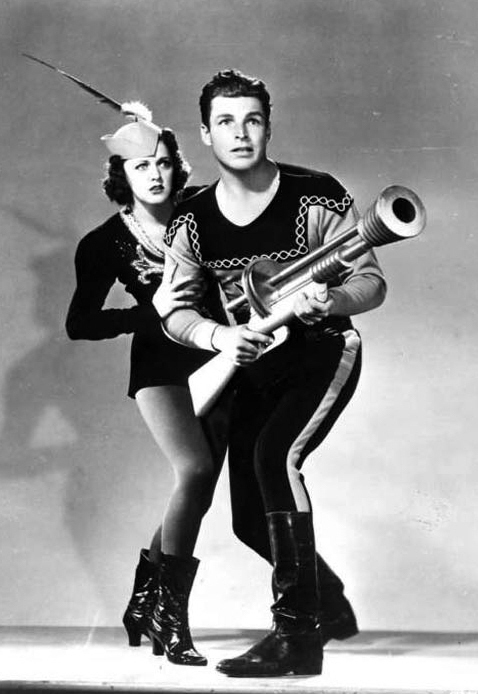 They both found escape in the popular adventure movies and science fiction magazines of the day, which featured stars like the dashing Douglas Fairbanks, Sr., and heroes such as Doc Savage and Flash Gordon. And together they wanted to write and draw the same kinds of stories that so thrilled them. That’s right, a couple of depression-era geeks. Joe and Jerry hung out together, dreamed together, created together! They were closer than brothers. They were the two sides of a single coin. And together, Joe and Jerry came up with a brilliant idea for a new heroic character. There had never been anything like it. The two young men knew the idea couldn’t miss. Or could it?! Often, timing is everything. Was the world ready for something different? Probably so. Were the publishers ready? Not yet. A primitive first version of the character appeared in 1933, in a short story published in a science fiction fan-magazine produced by Jerry. A few months later, he and Joe refined the character, produced a new illustrated story, and started looking for a real publisher. Then came the rejections, the closed doors, the don’t-call-us-we’ll-call-you disappointments. Four long years of NO! The two friends had knocked on the doors of every publishing company, every newspaper syndicate, and not a single editor or publisher wanted their story or saw the potential of their fictional character. At one point, Joe the artist got so discouraged that he burned all the pages of the story; with Jerry the writer managing to rescue only the cover from the fire. Flash Gordon, the original guardian of the galaxy. Things looked bleak for their new hero. And Joe and Jerry’s future was starting to dim. They shelved their idea and moved on to other things. Both men finally found work with various magazines, doing the things they loved: Jerry wrote; Joe illustrated. They were content — mostly. They had overcome social and economic adversity, and at a time just a few years after the Great Depression, they were actually being paid to create fiction and artwork. But Joe and Jerry continued to dream of their forgotten hero and all the fun and adventure they could have shared with the world. Little did they know the fate awaiting both them and their idea for a bold, new character, little could they imagine that their work would continue to influence and shape pop culture for the next eight decades, or that their names would feature prominently in the media of the then distant 21st Century. Little could they comprehend that theirs was an invincible dream that would not die! Tune in tomorrow to see the fate awaiting our heroes Joe and Jerry, as they continue their battle against the forces of adversity! Don’t miss Chapter 2 of AN INVINCIBLE DREAM!